We should strive hard to seek the goal. We may have to work hard to achieve the goal and its vital to realize that none of the 'success' people enjoy comes through shortcuts. The sweat, the pain, the hard work and persistent trials and failures leads to success. The success you attain through shortcuts may not last longer. Man needs difficulties in life because they are necessary to enjoy the success. If there is no pain, there is no gain. This post is for all my blogger friends who strive hard to keep their blogs up and running by hurdling all the challenges that come across their way!! Keep blogging and nothing should hinder the intensity of your passion!! Today's post is about a spicy Cashew Chicken curry. 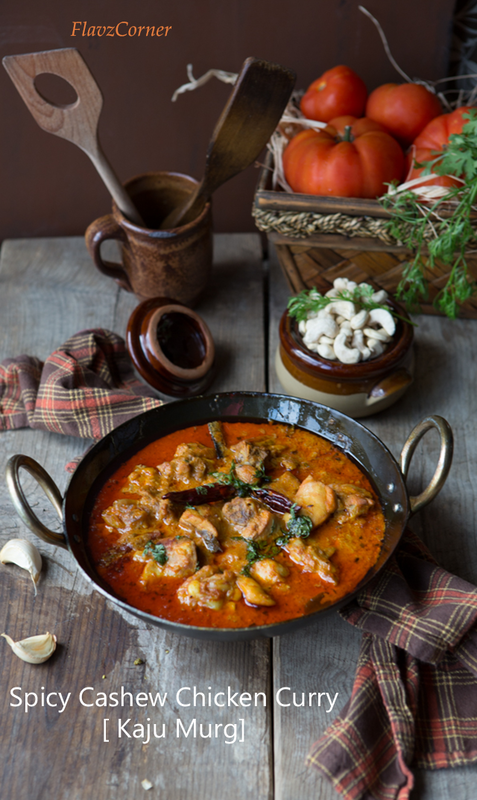 Chicken pieces are slowly cooked along with whole spices in a cashew based gravy to attain a juicy and aromatic dish that can be served with plain steamed rice or Rotis (Indian flat bread). One of our family friend was very sweet and generous to give me bags of expensive cashews and I had been using them in all possible ways to make use of the high quality cashews she gave me without wasting a bit. Hope you will give this recipe and try. 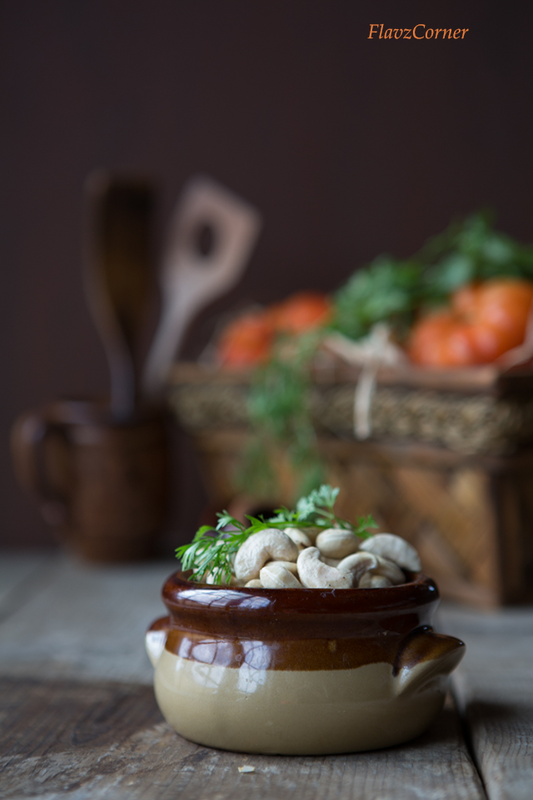 Soak the cashews in 1/2 cup of milk for half hour. Alternatively you can microwave the cashews in 1/2 cup of milk for a minute and keep it aside to cool. Grind the cashews with milk and make a thick paste and keep it aside. Heat a deep nonstick pan or cast iron wok with 4 tbsp of oil. Add the whole spices and fry for 30 seconds. Add garlic paste and cook for 1 minute. Now add the caramelized onion paste/finely chopped onions and salt. Cook till the mixture turns light golden brown. Now add Coriander powder, chili powder, Kashmiri chili powder, turmeric powder and garam masala. Cook till the raw smell is gone. Add the tomato puree and cashew paste and cook for another minute till the gravy looks thick. Adjust the salt. Mix the cleaned chicken piece and cover the lid. Cook on medium heat for 10 minutes. Water will start to drain out from chicken pieces. Now add 1 - 1.5 cups of water to the chicken. Close the lid and cook for 25 - 30 minutes on low to medium heat till the gravy becomes thick and oil starts to collect on the top of the curry. Check the chicken pieces for readiness and turn off the flame once it is cooked and the gravy reaches the desired consistency. Rub the fenugreek leaves between your palm and add it along with chopped Cilantro leaves to the curry. Serve them hot with Roti, Pulao or Naan. Adjust the amount of spices per your taste. Cashews paste made with milk naturally has got a sweet flavor, so the amount of spices I used in this recipe was good enough for our palate. You can adjust the consistency of the gravy by adjusting the amount of water. Caramelized onions takes this dish to another level. So try to use caramelized onions in this recipe. Beautiful words to go with a scrumptious curry dish! I can seriously drink that curry like soup. It looks so so good. Thanks for such kind words. You are so right, no pain no gain. Bloggers struggle is real, to juggle everything and this is our passion. So, to keep doing this requires a lot of strength. Glad you brought it up. Thank you. Thanks Asha for the sweet comments! What a nice visual treat of eyes....which one is better..photo or dish...I think both photo and dish are superb. I just dig in, Shibi. The curry looks so delicious. Oh, yum! I'm back from vacation, and am loving what you've made for me! ;-) This is so good. And such great advice, too -- terrific writing. Thanks so much. This curry looks so flavorful, delicious and comfy, Shibi. Curry looks rich and delicious! A perfect side dish! Love adding cashew in curry. A simple ingredient that takes the gravy to whole new level! I hope you Keep blogging too Shibi, and nothing hinders the intensity of your passion either. 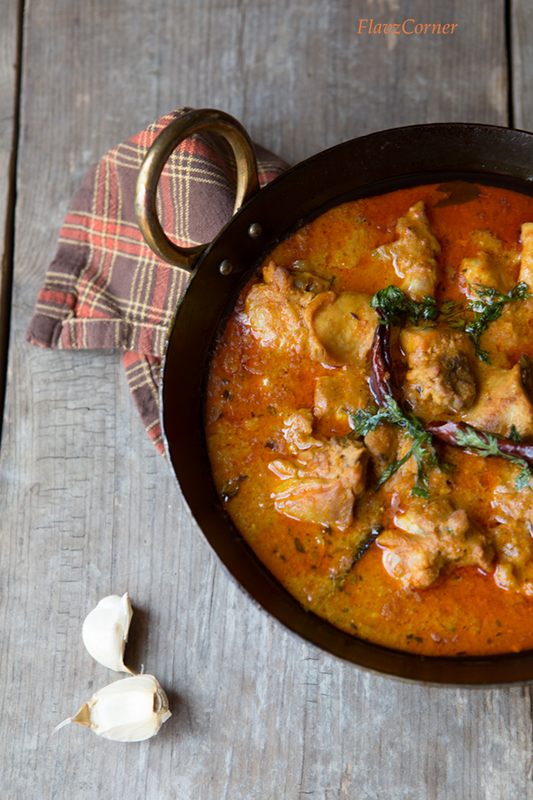 Your curry sounds exquisite - so delicious and flavorful and your photos are stunning! True! without struggle there is not gain, hope we would see light at the end of the tunnel someday. Chicken curry with cashew sounds realllyyy yummm.